The Shandon Hotel & Spa is excited to showcase a beautiful new Hair Spa with the most exceptional views over the bay! 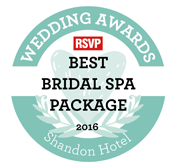 They have listened to you, their valued guests to the hotel & spa and they heard you! Who could refuse a luxurious hair spa treatment, head massage followed by a beautiful blow dry! Ladies – we all know you gotta look as good as you feel after a morning or afternoon in our spa! 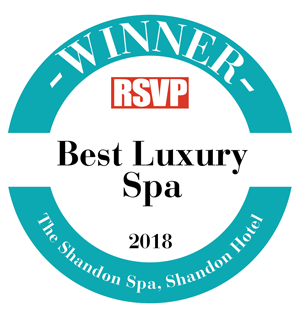 In the heart of the luxurious Shandon Resort I introduce to you, a new Hair Spa Salon with the most epic views over the bay. A haven from the bustle of busy day-to-day, it’s the perfect place to take some time out, and treat yourself to the Shandon experience. I thoroughly enjoyed every second and I cannot wait to try out the new ‘smartbond’ hair conditioner at home by L’Oreal. From an amazing welcome from the salon’s manager Elaine to their signature Shandon Detox Water or Herbal Teas, Elaine made me feel instantly calm and serene, or perhaps it was the sneaky non-alcoholic cocktail she made for me!!  Based on their signature S.H.A.N.D.O.N philosophy, Sincere, Hospitality, Ambience, Now, De-Clutter, Optimistic & Noteworthy, their blend of style ensures that they give you every opportunity to live in the ‘now’ and leave with a ‘note to self’ that you’ll be back sooner rather than later! The most important thing to new Shandon hair team is that they listen and focus on the details to give you exactly what you want. In addition you’ll enjoy the ‘spa’ vibe and leave feeling absolutely gorgeous! Elaine took up the mantle this week and brings with her over 30 years’ experience in hair fashion & styling. At the tender age of just 13 Elaine started her love of hair, at just 18 she launched her very own hair salon. Elaine was keen to continually develop her skills and also worked as a senior stylist for John Pauls in Derry City, Elaine was impressed with John Paul’s flair and credits him for the creative eye she now has for hair. Elaine is regularly requested for high end photo shoots & is very proud to see her work in various marketing campaigns for years to come and she is proud to say that even years on, her hair styling still didn’t date. 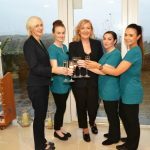 Elaine is busy now working with her new team of 5 in this busy hair & beauty salon within the Shandon Spa. She said the demand is unprecedented! Elaine states, ‘who could refuse the perfect blow dry after hours of relaxation in our luxury spa’. Elaine is happy to see the local trade growing and regular clients coming in for their monthly colours & cuts. Elaine is delighted to have at her fingertips the best possible product which is L’Oreal. L’Oreal is a quality product and customers of the Shandon are certainly #Worthit. 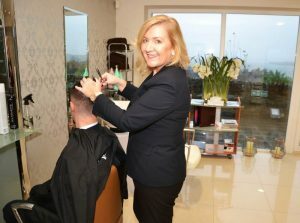 The Hair Salon was designed and created by Kelly McCarthy, wife of Warren McCarthy who is Shandon Hotel & Spa’s Managing Director. Kelly herself brings a wealth of experience from running her own successful hair salons in her base which is London. 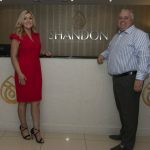 Kelly is looking forward to working with the team at the Shandon and creating a fabulous launch event in the near future which will include the latest in hair fashion, beauty and self-care, watch this space! The beautiful new salon will offer a full range of hair spa treatments, blowdries, upstyles, colouring, cutting for both ladies & gents. The new ‘Hair at Shandon’ is open to everyone, hotels residents, spa guests and the general public. As an introductory offer, Colour, Cut and Blow Dry is only €49 for a limited time only! Hotel residents and guests to the spa can also enjoy a discounted blow-dry for just €20 (based on medium to short, long hair and extensions will be extra). Hair is no longer maintenance ladies, it is an indulgence when you have your hair done at the Shandon.